At longest periods, the 2004 Sumatra-Andaman earthquake rang Earth like a bell, and the planet is still ringing. A multitude of whole-Earth vibrations were excited by the earthquake. The longest duration of the observed vibrations is 54 minutes (0.000309 cycles/sec), corresponding to the model 0S2, which deforms Earth's surface in a pattern that resembles a football. Preliminary estimates suggest that the earthquake raised this vibration to an average height of more than 0.1 mm worldwide. Internal friction within Earth causes the 0S2 vibration to lose amplitude by roughly 0.5% in each oscillation cycle, so the 0S2 should disappear into background noise a few weeks after the earthquake. By contrast, the "breathing vibration" 0S0, in which Earth expands outward and contracts inward without changing shape, loses amplitude by only 0.05% in each oscillation cycle. We measured that the Sumatra-Andaman quake raised 0S0 to an initial amplitude of roughly 60 microns = 0.06mm. This vibration of the whole planet should remain detectable in seismic data well into April 2005. 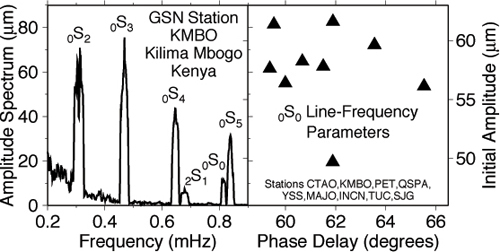 The left panel of the figure shows a spectrum estimate of 4 days (96 hours) of seismic data from GSN station KMBO in Kenya. Several spectral peaks that correspond to known Earth free vibrations are marked. The clear peak at lowest frequency is 0S2. The small peak at f=0.0008146 Hz (20-minute oscillation period) is 0S0. The Sumatran quake has raised these free vibrations to amplitudes 10 times larger than ever before measured with modern digital seismometers. In the right panel of the figure are graphed estimates o amplitude and initial phase angle for 0S0 at nine different GSN stations. The initial phase of 0S0 can be used to estimate the midpoint of the earthquake rupture process, relative to the initial breakage of the fault. Initial phases of 60-65 degrees suggest that the halfway point for the Sumatra-Andaman fault rupture occurred more than 200 seconds after it began. This suggests that the earthquake ruptured for more than 400 seconds (~7 minutes).